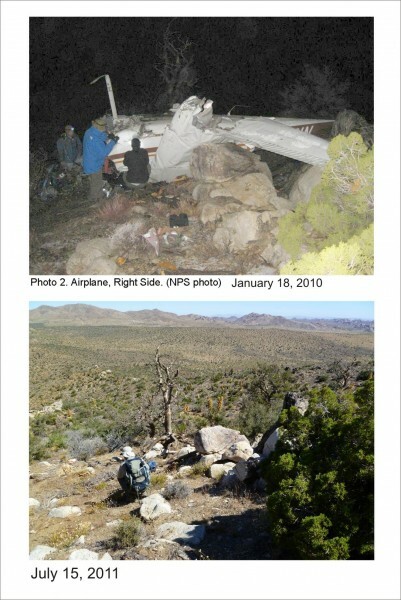 On the morning of January 18, 2010, a single engine Cessna 172 was enroute from the airport at Joshua Tree to the Palm Springs airport. It was a day of very heavy weather in much of Southern California and the aircraft went down in Joshua Tree National Park, setting off its Emergency Location Transmitter. Being with Riverside Mountain Rescue at the time, I received a standby notification for a mission. We were later told to stand down, as more local rescue teams were deemed sufficient. Knowing the general area of the crash, its ruggedness and the severity of the weather, I thought it unlikely there would be survivors. But as I checked the press reports the next day I was very surprised to find the two occupants survived, although injured. But they had a long wait. The aircraft impacted about 8:25 AM, and the site wasn’t found by rescuers until about 9 PM that evening. The injured occupants huddled in the inverted aircraft for the duration while it rained and snowed outside. In early July of 2011, I was able to obtain copies of the NSTB report on the incident, as well as the radar track. The reports suggested it could make for an interesting hike to the crash site, and a nice change from our not finding Bill Ewasko. JTNP Cessna crash radar track showing times, position and altitude. Here’s a real thorough story written about the incident in the Civil Air Patrol’s “Volunteer” magazine for April-June 2010. The CAP’s direction finding of the aircraft’s emergency location transmitter was key to the successful rescue of the occupants. Patrick McCurdy and I set out early on the morning of July 15 from the Juniper Flats trailhead. This was certainly a familiar starting point, but our destination and goal was decidedly different from usual. 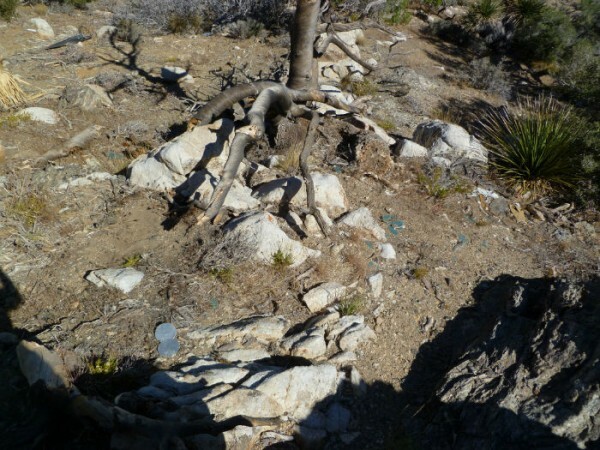 I figured the crash site was “only” about 2 1/2 miles southwest of the trailhead, so we headed west on the California Riding and Hike trail, and eventually turned south of the trail and headed up the rocky hills. Due to some luck in figuring the location, we soon started seeing some glittering in the distance. Upon getting closer, and seeing the rockiness of the terrain, what flashed through my mind was, “These guys should have been dead!”. 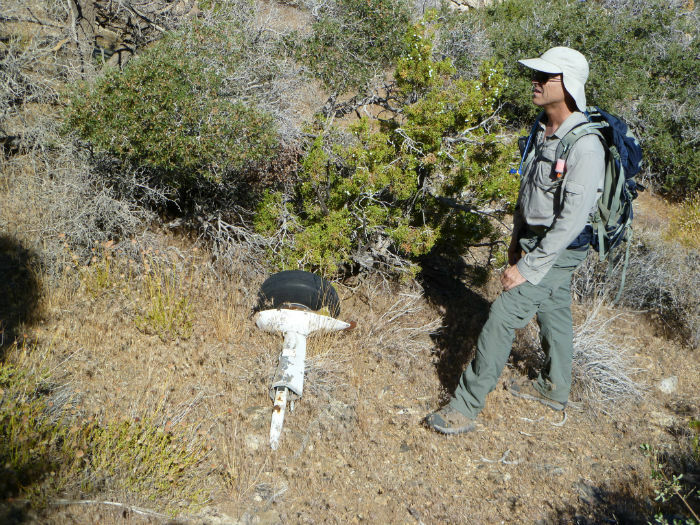 We found one of the landing gear struts a few hundred feet north of the main impact site. This suggested the aircraft impacted one of the stone towers, resulting in its inversion. Probably a combination of having an instructor on board with very high flight hours, the slowing of the aircraft by losing its landing gear, and the just plain luck of flipping into a small spot without rocks, resulted in their survival. The arrangement of boulders in the area is such that if they were even 50 feet in a different direction, the outcome would have been very different. There was still a surprising amount of crap at the site, including used medical supplies. Somehow they hoisted the aircraft out, but left a lot of other junk behind.